When a child first starts with us at The Pre-School Centre, they will have a member of staff that is “THEIRS”. A warm, mutual, affirmative relationship gives children the courage to express their feelings, and they know they can explore a safe place to which they can return. As the child learns to do things for themselves, they gain in confidence knowing that the adult is close by, ready to support and help if needed. That the children know who they are and where they fit in the nursery environment, and feeling good about themselves. That we provide rich contexts to encourage conversation, and to extend the use of language. That the children’s mathematical development can be extended through games in a carefully planned environment, so as to develop positive attitudes and dispositions towards learning mathematics. That the children develop the crucial knowledge, skills and understanding that helps them to make sense of the world. Being creative enables children to make connections between one area of learning and another, so extends their understanding. 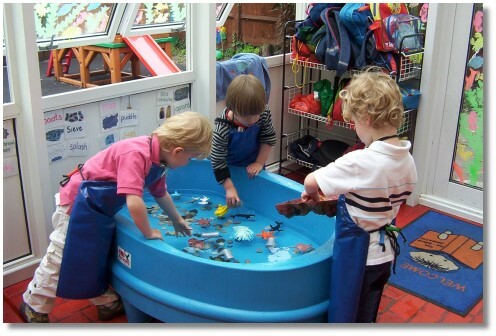 This area of learning includes art, music, dance, role-play and imaginative play. To improve skills of co-ordination, control, manipulation and movement.